At Adelaide Hills Pop Up Weddings, we believe that everyone is entitled to have the wedding of their dreams! Have you been looking for that relaxed, intimate, picturesque place to have your wedding? Or maybe you've dreamed of getting married in a forest or at a rustic winery? Well Adelaide Hills Pop Up Weddings might be just what you have been looking for. Adelaide Hills Pop Up Weddings specialise in intimate and relaxed, four and five hour garden wedding ceremonies and receptions. Offering great value, totally flexible weddings for 50 to 100 guests from $3,770 to $9650. Our secluded bushland setting provides the perfect place for an outdoor garden wedding under our towering candlebark forest. This beautiful multi award winning eco-certified winery is set on a private 20 acre nature sanctuary at Norton Summit in the Adelaide Hills, just 20 minutes from the Adelaide CBD in the foothills. Adelaide Hills Pop Up Weddings is proud to be a family owned and operated Adelaide Hills business and we love helping couples plan the wedding of their dreams. We will be with you every step of the way, from the moment we first meet you, to the day you say 'I do'. We also offer a wedding referral service, where we can put you in touch with other wedding services who have worked here in the past and do a great job, including celebrants, catering, drinks, photographers, makeup, flowers, cake and singers, or if you prefer you can just hire the venue with a drinks option and arrange everything else yourself. At Adelaide Hills Pop Up Weddings, you can do as little or as much as you like for your special day, the choice is yours. We have four unique private ceremony locations, including a secluded forest setting and winery settings. We would love to meet with you to show you our place and help you create your own love story. Please call us on 8390 1995 or email us at enquiries@adelaidehillspopupweddings.com to make a time to come and visit us. CHOOSE YOUR PERFECT WEDDING CELEBRATION - WE HAVE A FLEXIBLE AFFORDABLE WEDDING PACKAGE THAT WILL SUIT YOU! With our Pop Up Wedding Celebrations start from two hour ($1850), 3 hour ($2150) to four hours (from $2450), 5 hours (from $2750) you are sure to find the wedding package that is perfect for you. You can also add additional hours if this isn't long enough for you. ASK US ABOUT MAKING YOUR OWN SPARKLING FOR YOUR WEDDING DAY OR AS A SPECIAL GIFT FOR YOUR BRIDAL PARTY OR FAMILY. A FIZZOLOGY SESSION IS ALSO A FUN THING TO DO WITH YOUR WEDDING PARTY. Did you see Today Tonight's good news story on Adelaide Hills Pop Up Weddings ?? Our winery wedding venue Sinclair's Gully Wines, is open in spring through to the end of autumn on Sunday afternoons from 12 to 4 pm (closed during winter) and at other times by appointment. Please call Sue on 0409691995 if you would like to make a time to pop up and have a look at the venue at a time that suits you. Our wedding venue, Sinclairs Gully Winery is open by appointment, if you would like to come up and have a look at our beautiful venue and ceremony locations. Weddings and private functions are our specialty. 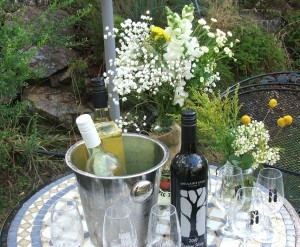 Please consider Sinclair's Gully Winery for your next special occasion, function or wedding. 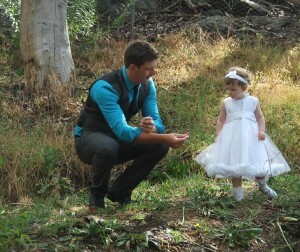 Or why not indulge yourselves with our four hour wedding ceremony and reception from $2250-$2500. Our Pop Up Wedding Packages and Prices include venue, celebrant an photographer.